Photograph by Roger Stalley. 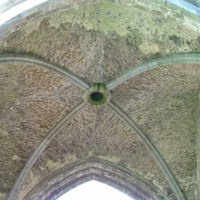 Three images of the crossing vault showing rubble webbing. Photograph by Roger Stalley. 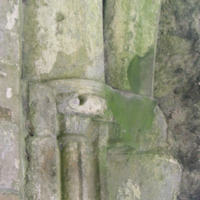 Remaining fragment of southern light of east window. Photograph by Roger Stalley. 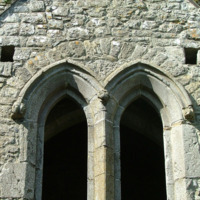 North transept chapel, general view along with detail of heads of lancet windows and of hoodstop. Photograph by Roger Stalley. Blocked doorway in north choir wall with syncopated roll and fillet moulding. Photograph by Roger Stalley. 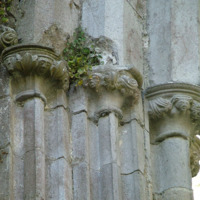 General view of crossing capitals and detail of central capital. Photograph by Roger Stalley. 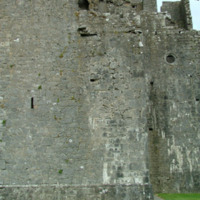 A view of the interior surface of the east wall of the original church at Fertagh. 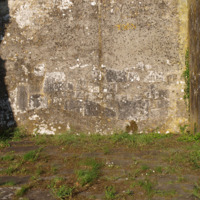 The masonry style may be cyclopean but this is obscured by the wall having been rendered with cement to create a playing surface for handball. Photograph by Roger Stalley. 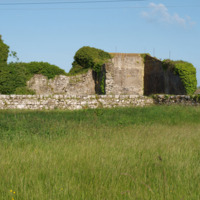 General view of the church at Fertagh. The nave is to the right of the image, it was converted into a handball alley. 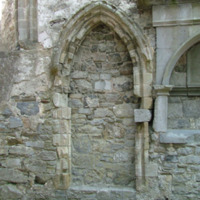 The MacGillapadraig mortuary chapel is to the left, north of the nave. Photograph by Roger Stalley. 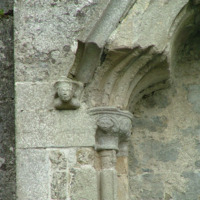 The north eastern corner of the south porch showing two capitals, one supported by an engaged shaft, the other by a missing endelit shaft. Photograph by Roger Stalley. A view from the crossing of the north choir elevation. Photograph by Roger Stalley. 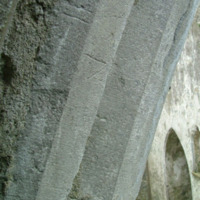 The chamfered orders of the crossing arch, close ups showing vertical tooling and masons' marks. Photograph by Roger Stalley. 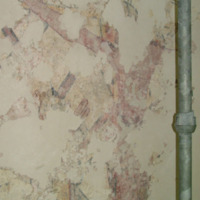 Recently discovered wall paintings in the south transept. Images taken while paintings under conservation. Photograph by Roger Stalley. 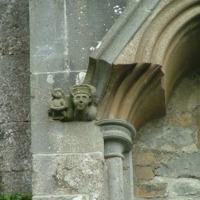 Details of a gabled niche on the south transept. Photograph by Roger Stalley. 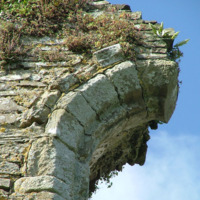 The turret at the top of the spiral stair in the south - west angle of the crossing tower. Photograph by Roger Stalley. 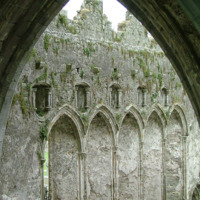 The round windows of the porch. 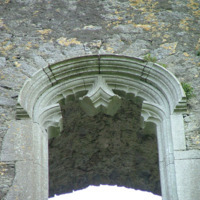 One may be the window located in the archbishop's palace or tower. Photograph by Roger Stalley. 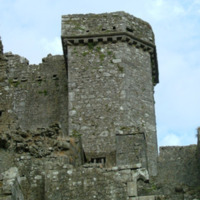 The south western angle of the archbishop's tower or castle with the west wall of the porch in the distance to the right. Photograph by Roger Stalley. 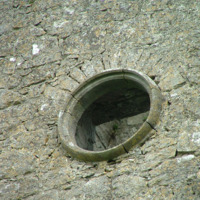 The finely moulded window in the north wall of the archbishop's palace or tower. Photograph by Roger Stalley. 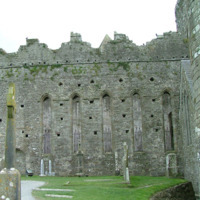 View from the north of the choir wall and the western tower. Photograph by Roger Stalley. The angle between the choir and the north transept. 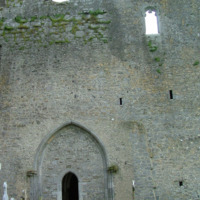 A small area of roof scar shows the original height of the chancel roof. Photograph by Roger Stalley. 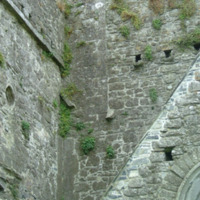 The north exterior wall of the choir.